About two years ago, I built a simple generator. It was just about as simple a generator as is possible to produce a box, a coil of wire, four large magnets, and a nail to rotate them on. This has been sitting in my office for some time and makes a really good demonstration. Even many people with a strong electrical engineering background seem to have never really understood what was going on in generators. So I decided to take the next step. The generators on the power system are three phase generators with some having a forth wire for a neutral. Having essentially no tools, I started to look around the internet for DIY plans I could use to make one. This one caught my attention. It is really simple requires no special tools to make but is not a three phase generator. 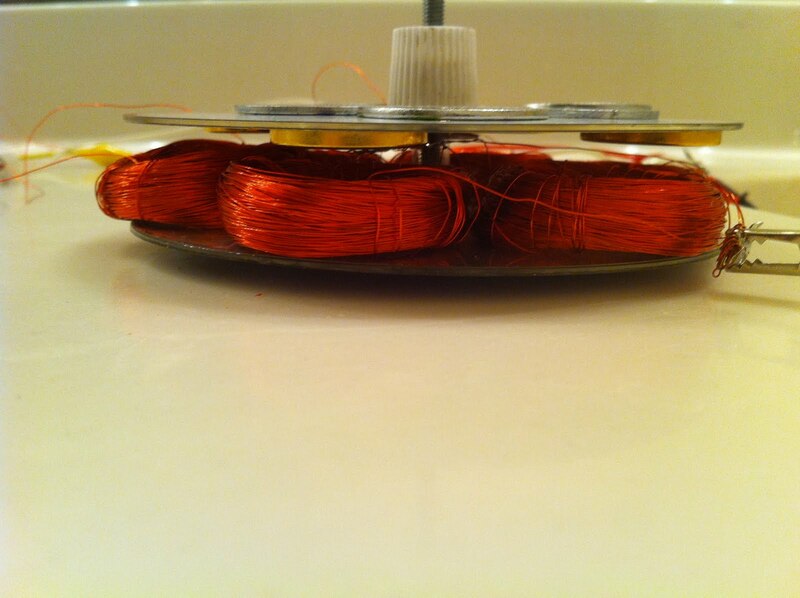 However I realized that I could modify the basic design to make a three phase generator. 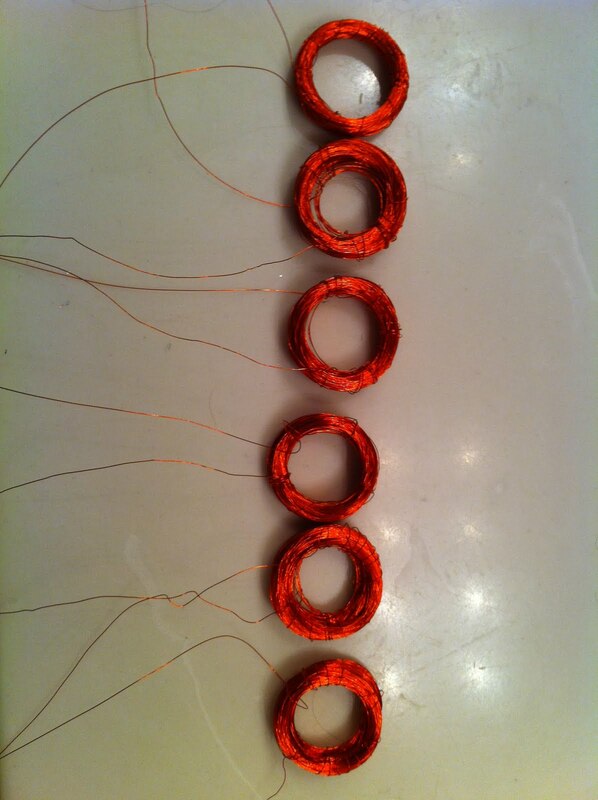 By increasing the number of coils from 5 to 6, you get six phases where any two coils on opposite sides are in phase with each other. 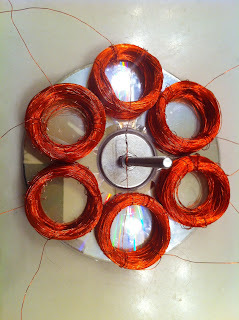 All that must be done to make a three phase Y connected generator is connect together opposite sides then connect one end of each group of coils together to make the neutral. 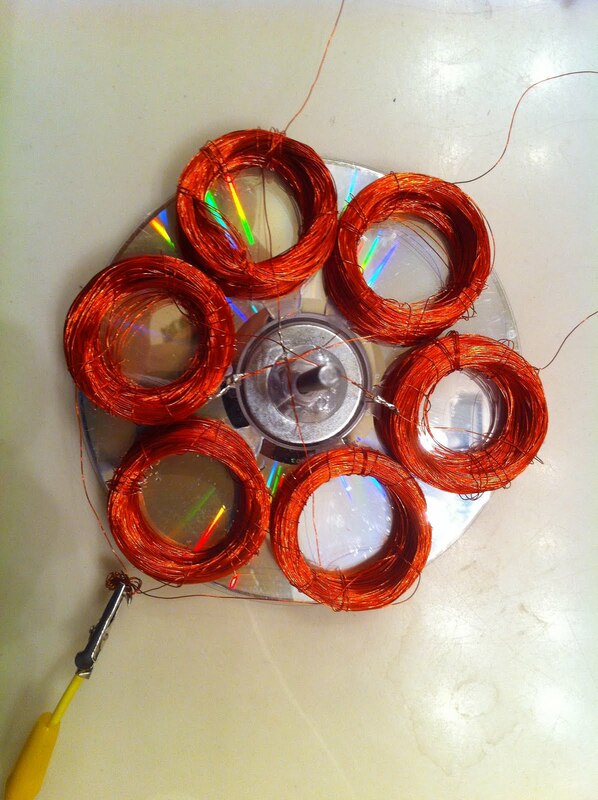 The wiring of this sort of pancake generator is best explained at this site. 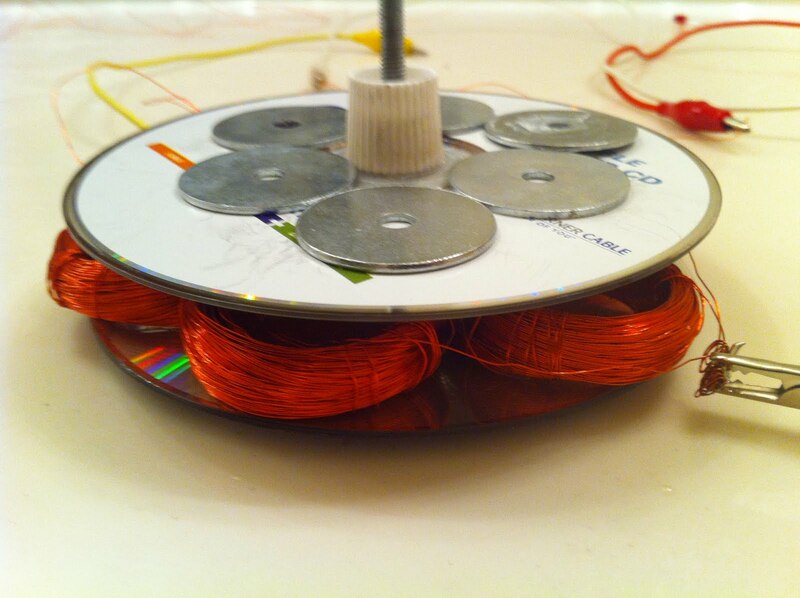 These coils were then mounted on a CD with superglue. Spacing between coils was kept even so that the coils on opposite sides would have current in phase to each other. The rotor I used was mostly the same as that in the generator project I mentioned before. Magnets were glued to a CD at 0, 90, 180, and 270 degrees. 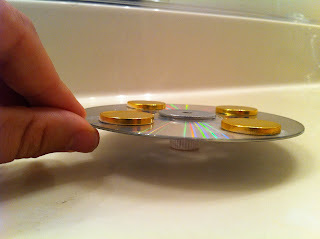 The magnets flipped orientation so magnets on opposite sides were pointing the same direction. 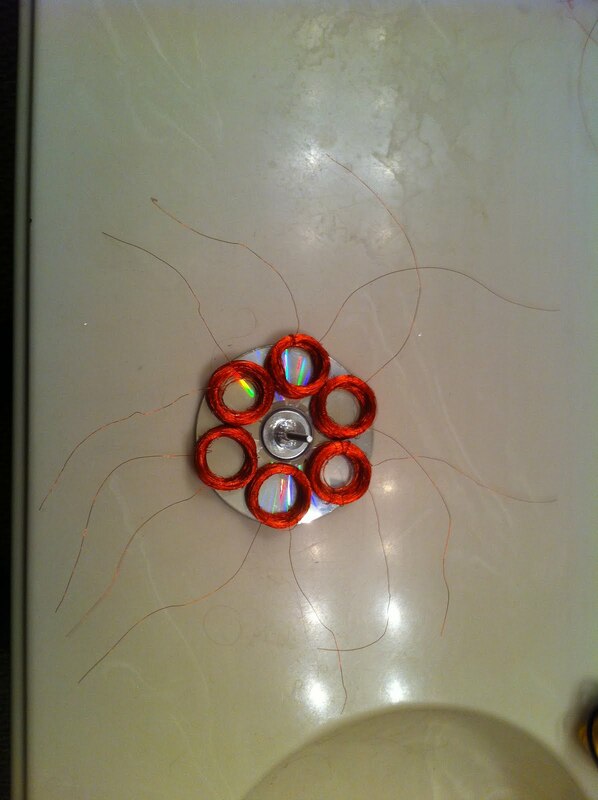 A toothpaste lid was glued to the top, a large washer was glued to the bottom. 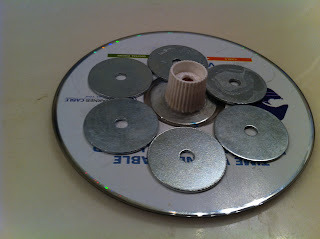 The components were connected together as in the toys from trash design, except for an acrylic sheet being used to substitute for the wooden block the bottom CD is . I also put some washers on the back of the magnets to make a crude backing iron. Once everything was connected together, opposite side coils were connected together. You have to be a little careful about getting the two sides to be in phase with each other. 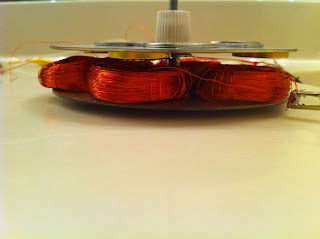 Assuming the coils are in the same orientation, opposite side wires should be connected together. I was fortunately careful to keep the alignment constant so this was straight forward. 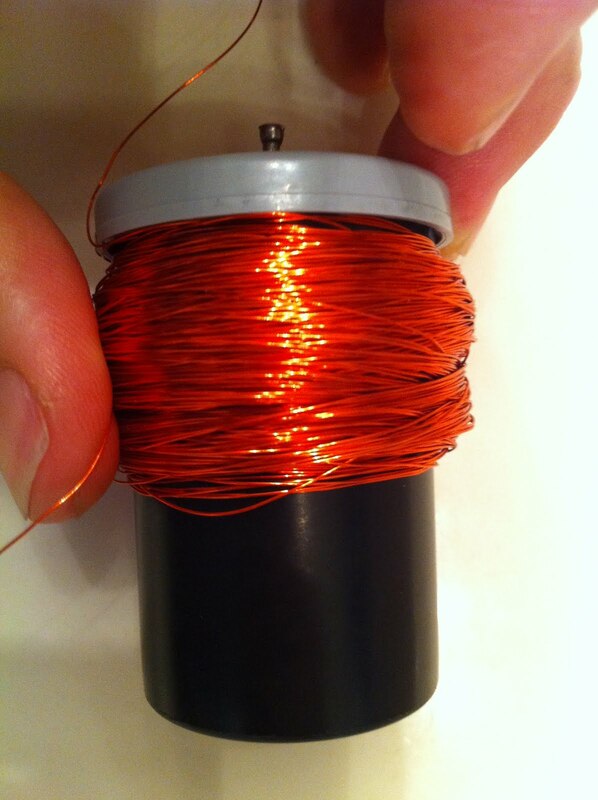 If one coil was wound in the opposite direction than the wiring must be reversed. 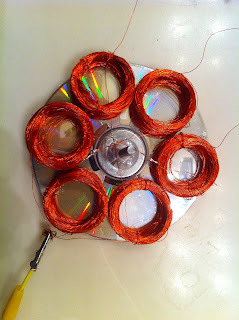 One phase of each coil on one half of the CD were then connected together. This left the generator with three phases on one half of the generator and a neutral which connects on the other half of the generator. A classic Y configuration. After connecting together all components, I spun up the generator. 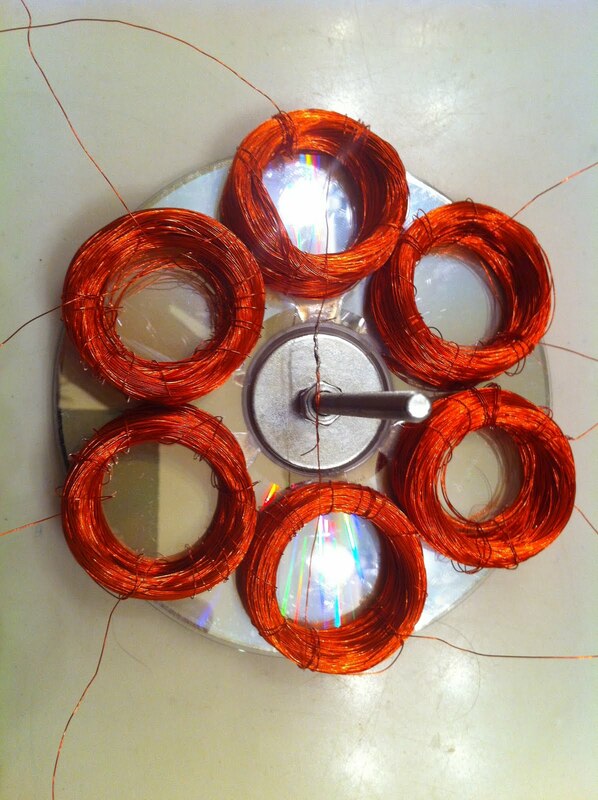 It would produce 0.3 Volts phase to ground AC and 0.5 Volts phase to phase. Theoretically, this generator should produce 1.732 times as much phase to phase voltage as phase to ground voltage. This was close enough to convince me I set everything up correctly. Overall, I was pretty happy with this generator. I managed to produce a three phase generator with about $20 in components and no tools beyond a soldering iron and wire cutters. After looking around online for a while, I believe that this is the simplest three phase generator design out there. Because of this, you can really get an idea of what is happening in the black box that is the usual generator. For example when you are thinking abstractly of phases, the idea that A phase leads B, leads C can be difficult to understand. When you actually see the magnet reach A phase, then B phase, then C phase it starts to make more sense. The disadvantage of this generator is that it really cannot do anything. 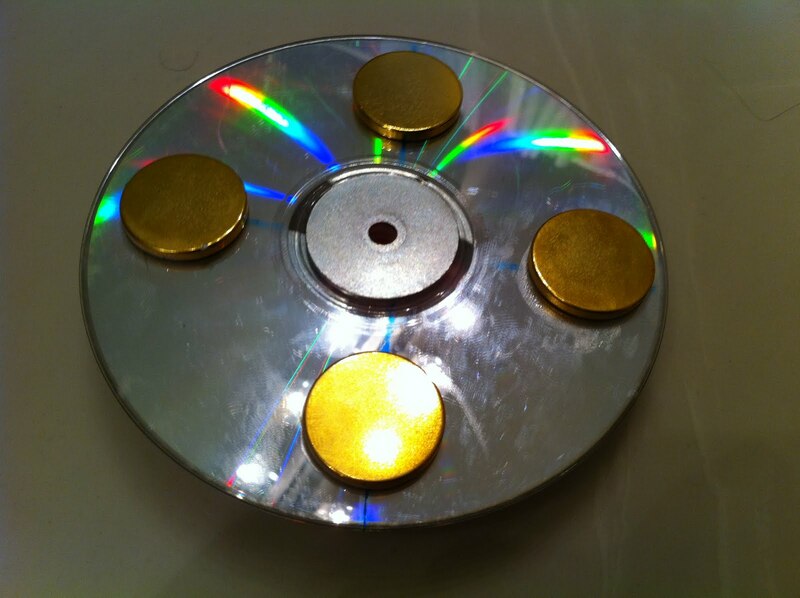 If you spin really hard you can make a LED blink a little bit. Unlike the simple one phase generator I made it isn't easy though. I was hoping to make a simple straight forward 3 phase motor to go with this generator. I didn't even try. it isn't much good for powering anything but a volt meter. To try and eliminate these problems, I altered the design to include iron cores. This created other problems though.